Goodyear first started making bicycle tires in 1898 and manufactured them until 1976. Now they are at it again. The Goodyear Escape is billed as a capable all-conditions trail tire available in a wide range of sizes. Widely-spaced and carefully siped square knobs generate edge-to-edge grip, high tech rubber compounds ensure traction across a broad range of terrain, and durable casings offer security. Size options are 27.5 and 29×2.35″ based on 25mm inner rim, and 27.5 and 29×2.6″ based on 35mm inner rim. Mtbr tested the 29×2.35 offering, which weighed 695 grams. The Goodyear name is synonymous with tires… car tires. But we have a feeling that is about to change. For non-history buffs, Goodyear first started making bicycle tires 1898 and manufactured them until 1976. The company itself is named after Charles Goodyear, the inventor of vulcanized rubber, so to say compound technology is in its DNA would be an understatement. An innovator from the beginning, Goodyear was the first to introduce tubeless tires for automobiles in 1903. And Goodyear tires are on many performance motorcycles, Formula 1 and NASCAR race cars, and now performance bicycles — both mountain and road. Widely-spaced and carefully siped square knobs help generate edge-to-edge grip. 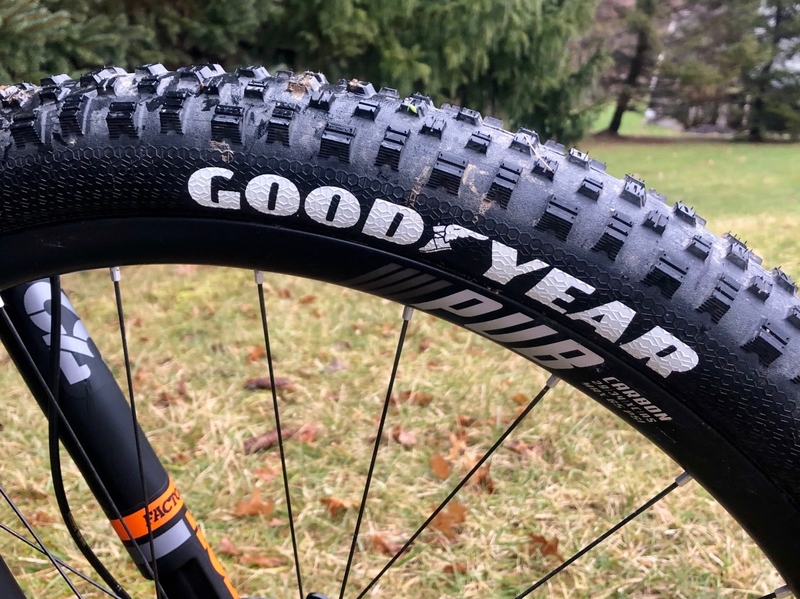 In April 2018, Goodyear announced its return to the world of cycling as well as a wide range of performance-driven bicycle tires and tubeless sealant. The new product line spans road, commuting and mountain. The Goodyear Escape aims to generate edge-to-edge grip, employing the sophisticated rubber compounds of which Goodyear is known. All while keeping weight low, rolling resistance minimal, and punctures rare. The Goodyear Escape is grippy and robust to the touch. 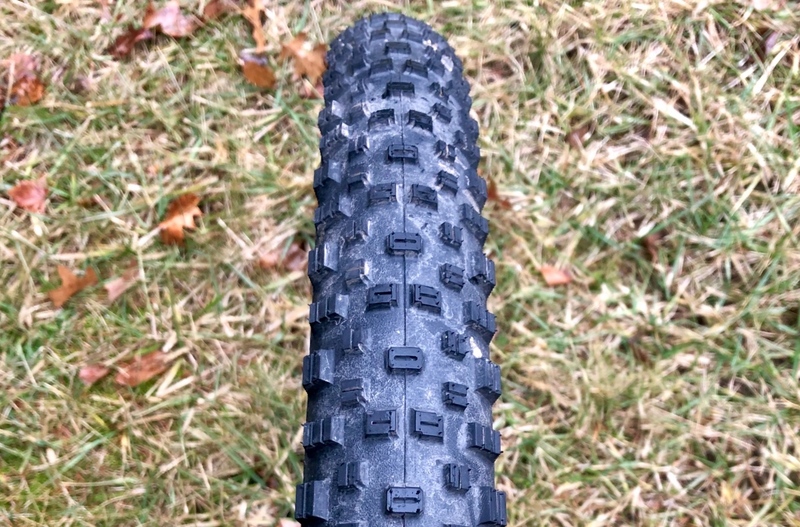 The sidewalls have a honeycomb-like pattern and the space between knobs has a slight tooth to aid with mud release. Knobs themselves are sturdy and vary from 3-5 millimeters in width, with generous vertical and horizontal siping. 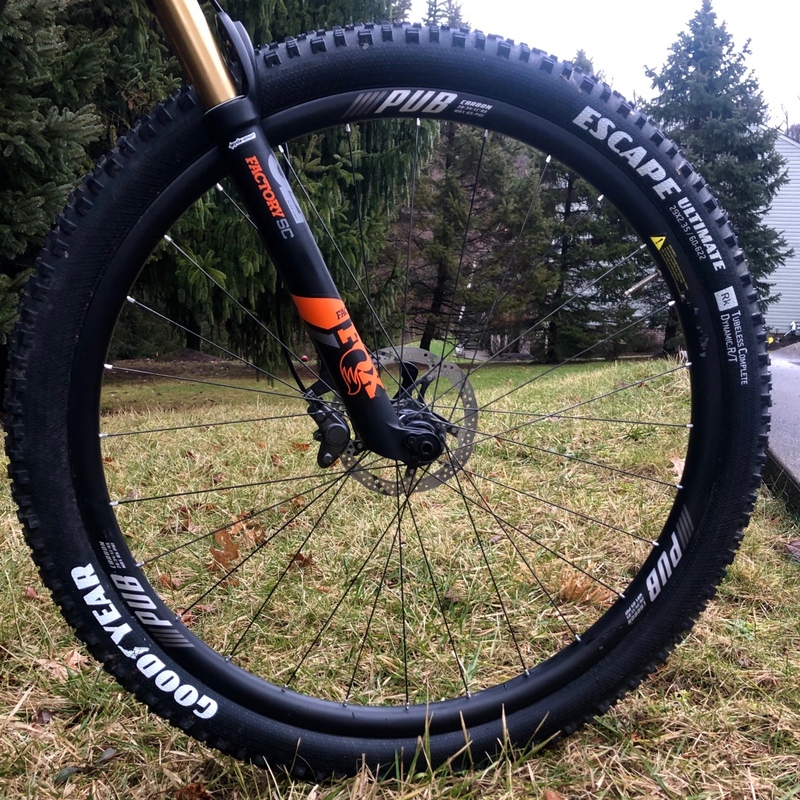 The Goodyear Escape trail tire comes in 27.5 and 29×2.35″ based on 25mm inner rim, and 27.5 and 29×2.6″ based on 35mm inner rim. Setup and inflation is a breeze but the bead is tight, requiring a little extra elbow grease to snap them into place. Goodyear states that “Tubeless Complete” on the Escape denotes the tires can be set up sans sealant and will function and ride just fine. I on the other hand, always want sealant and hate walking out of the woods so, in goes the Orange Seal and the peace of mind. Goodyear claims a 2.35’’ width, but they came in a touch narrow when mounted on our test rims. But the ride was nonetheless impressive. The Escape boasts endless compound and casing options, whether you desire a supple sidewall or a bombproof cut resistant casing. The Ultimate casing uses a smaller thread fabric than others in the lineup, making the tire more supple and faster rolling with improved traction. The compound used in the Escape Ultimate is Goodyear’s new Dynamic: R/T as in rugged terrain, which is specially formulated to balance grip, wear, and rolling efficiency. Knobs themselves are sturdy and vary from 3-5 millimeters in width, with generous vertical and horizontal siping. Grip and cornering traction were impressive. Bombing down descents I felt confident in the braking control and always willing to push hard into rooty sections. The sharp edges of the knobs cut into the ground, delivering plenty of traction. 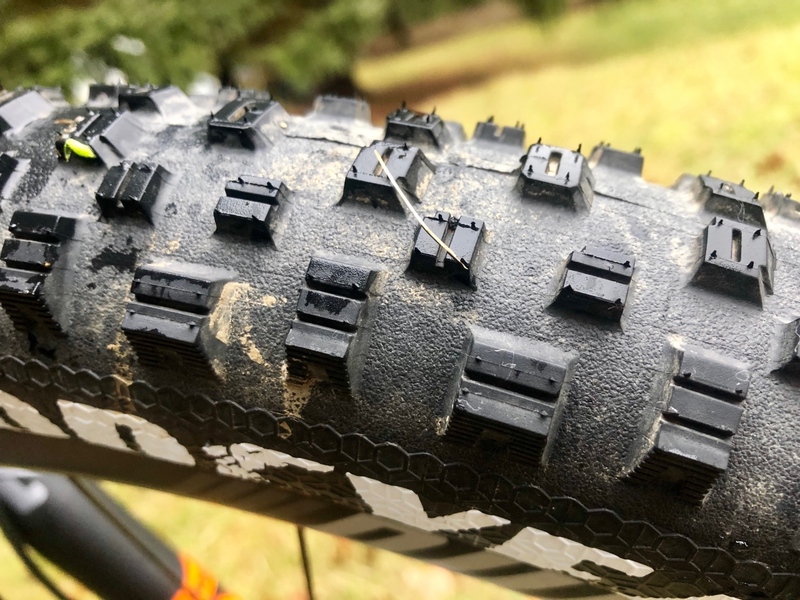 The ample knob width and siping pattern give the Goodyear Escape fierce grip while carving loamy trails, and a sharp back end of the center knobs offer a solid bite when out of the saddle sprinting. Just as important, I did not have a single flat while riding the Goodyear Escape and had very little air loss when left unattended for days.